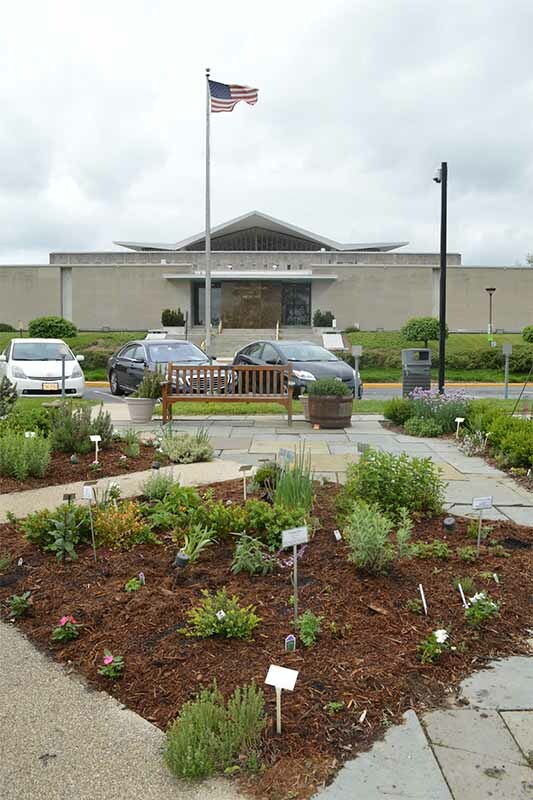 Herbs and flowers thrive in the garden planted opposite the front door of NLM’s main library building. Master gardeners are happy to answer questions as they work in the garden on Monday mornings. 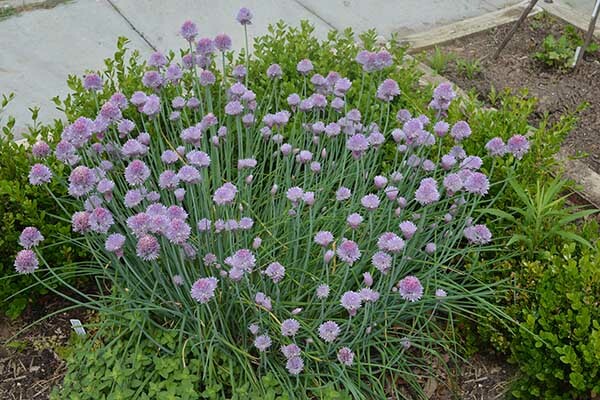 Blooming chives add a pop of color to the garden. 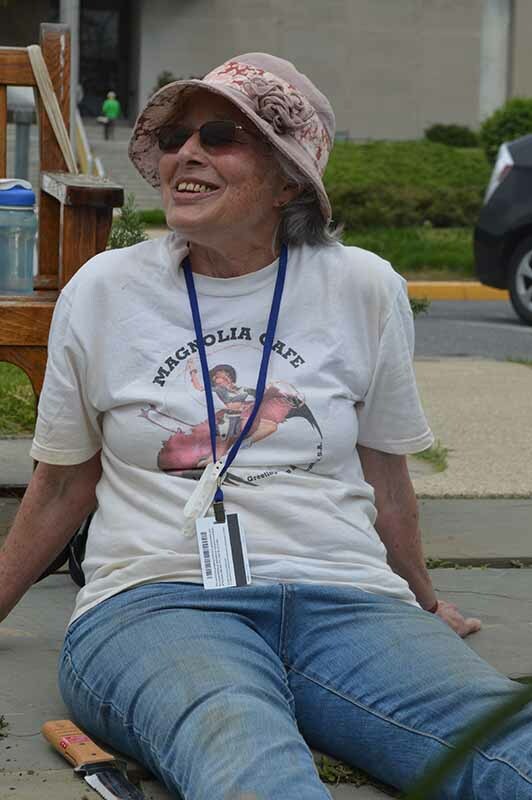 Jeanne Weiss takes a moment to relax after pulling weeds. Weiss says her work in the NLM garden is a way to give back to NIH since her treatment at the NIH Clinical Center. The herb of Paraguay, also known as Stevia, is a natural sweetener. A master gardener tends to the plants in the spring. The NLM garden features plants known for their healing qualities. 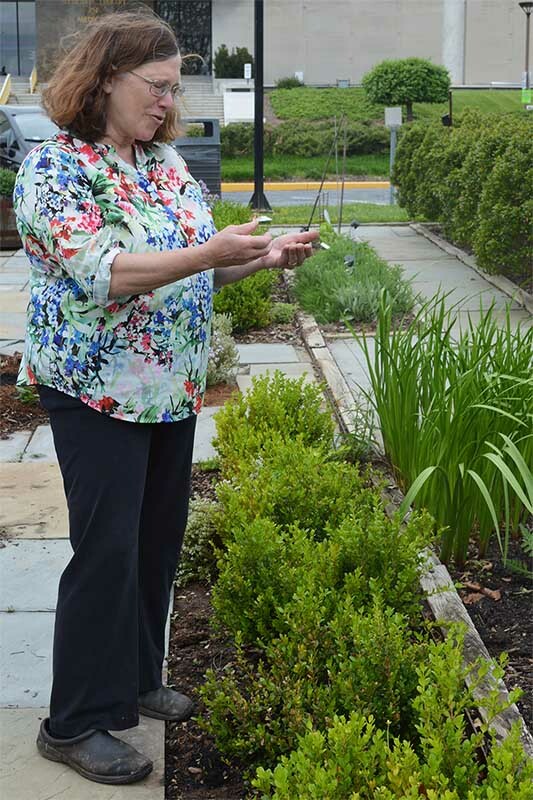 So says Montgomery County master gardener* Mary Musselman, one of several dedicated volunteers who tend the National Library of Medicine’s colorful herb garden, across the oval driveway in front of the main Library building. Bracketed by benches, this unique haven on the NIH campus is intended to showcase the healing power of nature. Since the beginning of time, people have used plants to cure illnesses and treat wounds. In previous centuries, medicinal gardens were carefully cultivated and the knowledge of their healing properties passed on to succeeding generations. 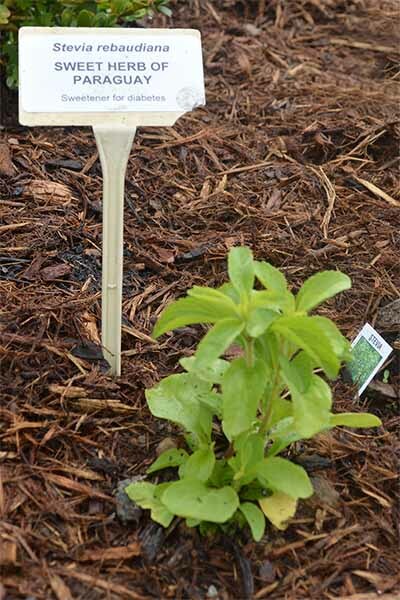 The NLM Herb Garden was created in 1976 as part of NIH’s celebration of the US Bicentennial. It continues to thrive today, with some of those original plantings still going strong. The garden’s lush variety of herbs captures the endless curative and useful qualities that made these healing plants integral to the development of modern medicine. Today, it’s lovingly maintained by volunteers from the Montgomery County Master Gardener Association and the Herb Society of America, Potomac Unit. Master gardener Mary Musselman shares her knowledge of the garden’s herbs. We’re sorry we can’t offer a scratch-and-sniff feature with this piece because, as Musselman escorts this reporter around the garden, she points out and invites touching of fragrant sprigs of everything from bay leaf to dill to lavender to lemon verbena to oregano. Heavenly! 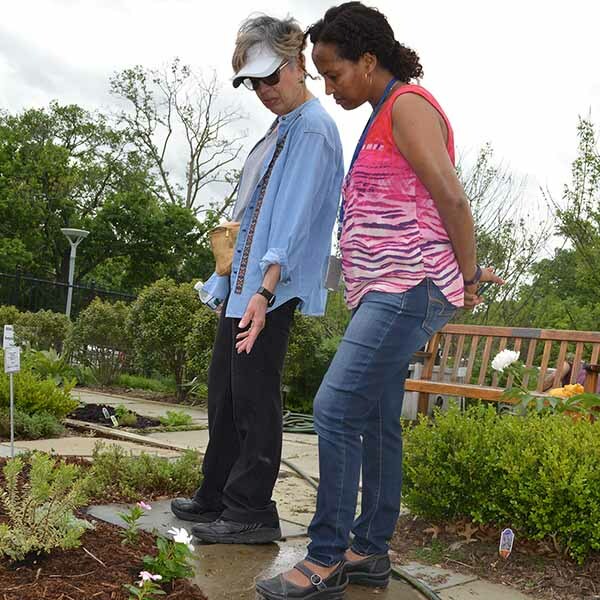 During our chat, in fact, an NIH staff member from Ethiopia drops by to see the garden, which she loves, and to talk with its tenders. Selma DeLeon promises to give her mountain mint from her home garden. In return, the employee will bring the gardeners a batch of orzo with herbs next Monday. A couple of other NIH staff members also stroll through for a moment’s reverie or relaxation. Not given to relaxation themselves, the gardeners work every Monday morning, weather permitting, from 9:00 to 11:00, April to October. Sometimes they visit during the week, for watering. The public is welcome to chat with the gardeners and to visit the garden anytime. 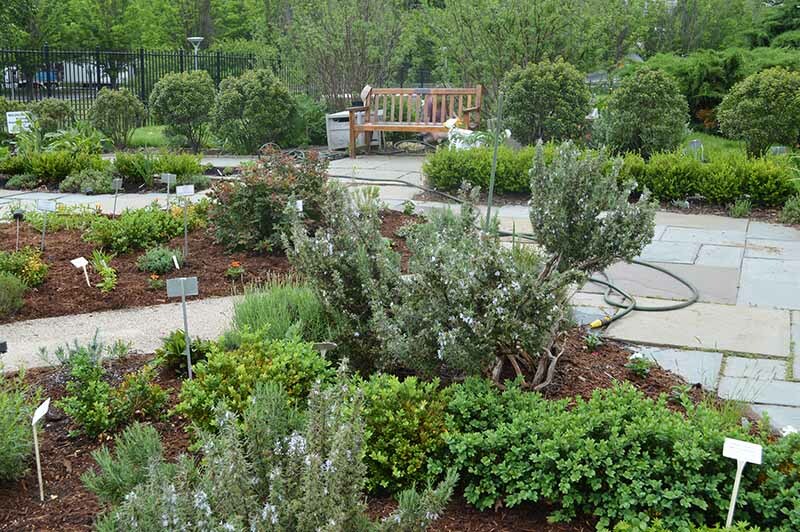 NIH employees and the general public are invited to an open house Monday, June 19, from 10:00 am to noon in the NLM Herb Garden. Hosted by the Montgomery County Master Gardeners and a local garden club, the event will feature herbal tea and herbal treats. Master gardeners will be on hand to answer your questions. As we continue our stroll, we run into several other master gardeners, often hidden behind plants. Her face damp with perspiration, Karen Kim robustly cuts chunks of soil with a large garden spade in an overgrown area of the garden. Sandy Occhipinti digs in another corner, which showcases herbs used in Native American healing and ceremonies. She worked at NIH for 30 years, at the National Cancer Institute and Eunice Kennedy Shriver National Institute of Child Health and Human Development, before retiring. 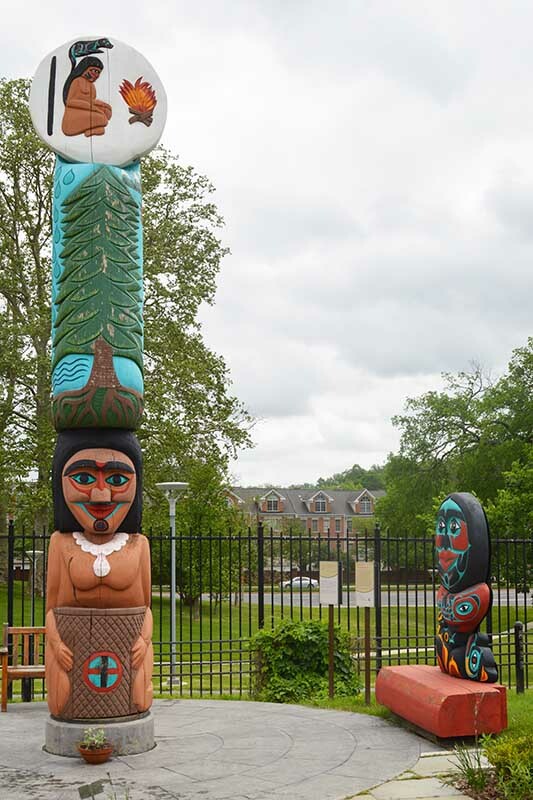 Hand-carved totems overlook the NLM garden. The Native American section relates nicely to a dramatic element added to the Herb Garden in 2011—a healing totem, part of the NLM exhibition, Native Voices: Native Peoples’ Concepts of Health and Illness. Through colors and symbols, this unique work communicates ancient legends from a variety of tribes. 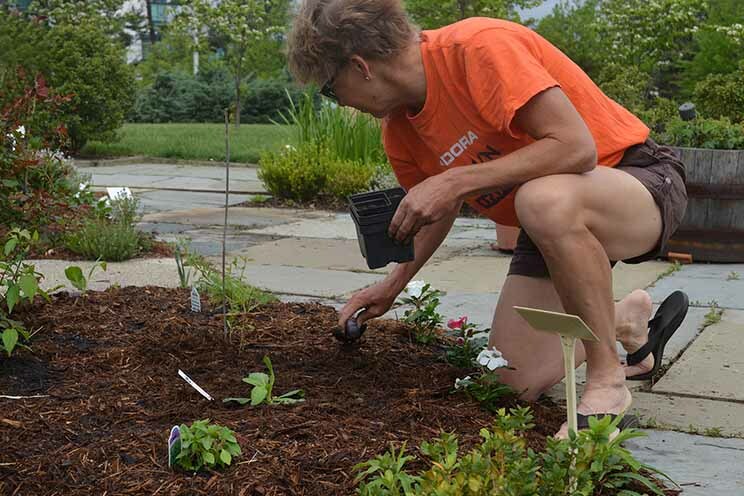 Other master gardeners who tend to the NLM Herb Garden are Debbie Alexander, Marty Isaacson, Donna Kolis, Doris Leatora, (former NLM Board of Regents member) Deanna Marcum, Susan McCall, Ermona McGoodwin, and Ida Wallenmeyer. *Founded in 1973, master gardener programs (also known as extension master gardener programs) are volunteer programs that train people in the science and art of gardening. These individuals pass on the information they learned during their training as volunteers who advise and educate the public on gardening and horticulture. Is there Chocolate Mint in the garden this year? I’ve seen it there a few years back. Thank you for your interest in NLM’s spectacular garden. The garden currently has peppermint and spearmint. The gardeners tell us that they have planted the mints in pots so they won’t “go bizerk.” But they did say if someone wants them to grow chocolate mint, they will! If anyone has a starter for the chocolate mint, let them know. The gardeners who care for the NLM Herb Garden would like to share this recipe for lavender lemonade, which receives many requests. 1. In stainless steel saucepan bring to a boil: 8 cups water, 1 1/2-2 cups sugar, and 1/2 cup dried culinary lavender buds. 2. Remove from heat and steep for 2-5 minutes (longer can make it more bitter). 3. Strain the lavender sugar water and allow it to cool. Then refrigerate until cold. Can the dried lavender that was given to us last week by the Herb Garden master gardeners be used to make this delicious lemonade? The lavender that was given out at the Open House can be used to make a little sachet or for simply enjoying its scent. For baking, the gardeners suggest that you use culinary lavender buds. ok, thanks, I will check at the MOM’s organic market.